The Sunpak® outdoor patio heater provides radiant warmth outdoors for you, your family and friends. Its slim box shape fits easily into many architectural designs. Sunpak® is CSA design certified as an unvented infrared heater for outdoor installation. Sunpak is the preferred unit for most applications. They maintain a defined footprint of heat, operate with the flick of a switch and require little service. Slim Body and 0-30 degree angle mounting option on most models. The effective range of a Sunpak outdoor patio heater when mounted overhead, position horizontally is 12' x 10' at the "comfort zone" (normal sitting height) in most applications. Change the angle up to 30 degrees and mount on a wall its effective range becomes 12' x 8'. 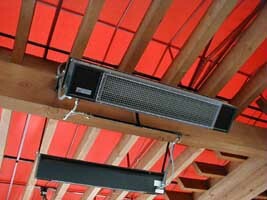 Most people feel the effective range of the Sunpak S25 heater when it is mounted no greater than 8' above the floor. If you install the Sunpak unit at 7'6" above the floor you should consider the Sunpak S34 heater. 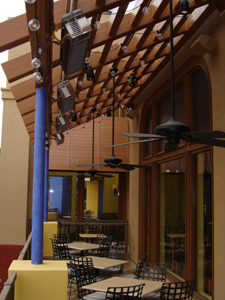 The most comfortable application will incorporated multiple outdoor patio heaters. It is best to have the infrared heat focused first on the most exposed side of the patio to cut down on the wind chill effect. The next patio heater should be placed in such a manner as to cross over heat rays so that you receive comfortable heat from two or more sides. Get a copy of the Sunpak Owners Installation Manual here!